Every now and then, the appliance responsible for cleaning your lucky socks and favorite sweater needs a little TLC. Neutralize odors and maximize efficiency with these easy maintenance musts. When you throw a load of laundry into the washing machine, your clothes emerge stain- and sweat-free, and that’s a wonderful thing. But how often do you actually wash the washer? It may seem counterintuitive, as the appliance deals entirely in detergent and suds, but if left untouched, it could eventually leave your favorite outfit smelling worse than it did in the hamper. 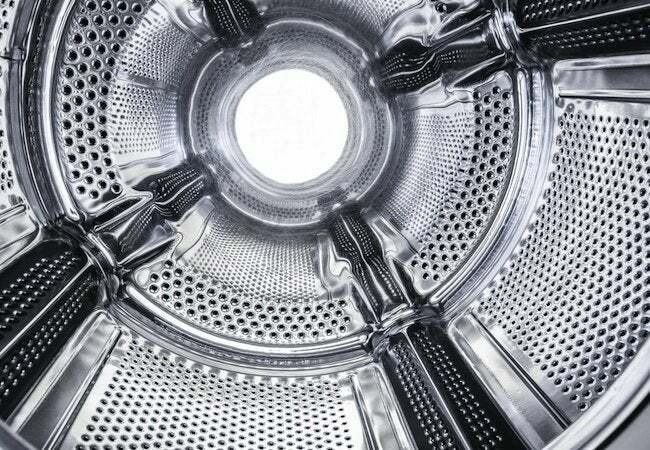 Fortunately, using only a few household staples, you can clean a washing machine in a few easy steps. Like it or not, loose dirt inevitably collects in the washing machine. And if you own a pet, you can be sure that some of its fur—some way, somehow—will find its way into the appliance. So even though your clothes come out clean, contaminants are left behind on the inside of the washer. From week to week, remember to wipe it out so that lingering crud doesn’t land in your next load of laundry. I recommend using a vacuum cleaner. Outfit it with a brush attachment, double-check that the washing machine’s drum has dried completely, then run the vacuum head over all parts of the cylinder. You may be surprise by how much you pick up! Newer washing machines have a special self-cleaning cycle that helps eliminate odors. But if yours is an older model, you can fight smells by running the empty machine on a hot-water cycle, with liquid chlorine bleach added to the detergent drawer. Afterward, open the door to the drum, so the interior can fully dry out. Repeat this exercise at least once a month to keep your machine smelling its freshest. 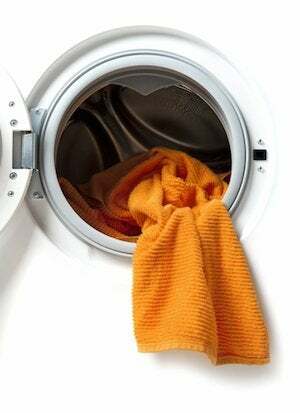 If despite your best efforts, a musty odor lingers in the washing machine, mold or mildew may be responsible. Particularly vulnerable are those components of the machine where water collects—the detergent tray, for example, or the rubber seal around the door. The trick here is to spray the problem areas with a solution of vinegar and water. This, too, should be done once a month for best results. On the back of most washers, inlet screens work to filter out particles suspended in the hot and cold water entering the machine. Here, dirt and limescale accumulate over time—occasionally, that buildup can disturb washer operation. If you’ve noticed poor performance, the first thing to check is the inlet screen. After unplugging the washer and turning off its water supply, unhook the hot and cold water lines and remove the filters with careful twist. Soak each in vinegar to remove the limescale. Quickly rinse and reconnect them, then plug the machine back in. You should see immediate improvement.